Acer’s Aspire S7 (the 391 model) was introduced last year to quite a few ‘oohs’ and ‘ahs’, mainly because it was a thin and light little thing with an attractive design. This year’s Aspire S7-392 looks just like the old one, but it has a few significant differences in its configuration. The main difference is that it runs a fourth-generation Intel Core i7 ultra-low voltage CPU. What you get in the Acer Aspire S7-392 is a 13.3in Ultrabook with a weight of 1.3kg and an overall thickness just under 15mm (including the little rubber feet on the base). There’s Gorilla Glass 2 on the lid, which protects it from scratches, and the aluminium construction of the chassis makes the unit feel quite sturdy overall. Prior to weighing the S7-392, we thought it would come in under 1.3kg, because it just feels so light and well balanced. At this point, we need to point out that the S7-392 also has a touchscreen, which is very handy when using the Windows 8 Start screen in particular. The touchscreen supports 10-finger input, and it can tilt all the way back until it’s sitting flat on a desk. We think this is a good design as it allows you to more easily use the Ultrabook for playing games or interacting with photos. If you don’t have the space to spread the unit out on your desk, then you can leave the base up at 90 degrees, and sort of use it as an upside-down laptop — we actually used it like that for a while. However, the model that we reviewed didn’t ship with an accelerometer, so the screen didn’t rotate automatically when we turned the unit around. A Full HD resolution is provided, and the screen uses IPS technology. It’s a fine looking display that shows plenty of detail, rich colours, and it can be seen quite well from different angles. It’s a good unit to consider if you’re a photographer who wants a model with a good screen and an SD card reader. That said, the glossiness of the screen can make it hard to see images properly depending on where the light sources are in your environment. Even with the brightness all the way up, reflections were still a little bit annoying. The touch performance of the screen was top-notch; it was a pleasure to use Windows 8 swipe-in gestures, to flick through the Start screen, and to move around zoomed photos. A lie-flat position makes using the touchscreen a little easier, as long as you have the space for it on your desk. We’re quite used to touch-enabled laptops these days, and the whole ‘type-and-swipe’ experience is something that we take advantage of a lot. In addition to the tasks we just mentioned, we also often just point at the screen rather than moving the pointer with the touchpad. The hinges hold the screen secure enough so that there isn’t any wobble when the screen is tapped; in fact, the screen barely moves at all. Because of the Full HD resolution, it can be hard to tap on tiny icons and small text accurately, but you could always enlarge these elements so that they become easier targets (our unit came with the display settings set to 125 per cent magnification). The base of the unit has much improved connectivity over its predecessor. You now get a full-sized HDMI port, a full-sized USB-based SD card slot (though the cards stick halfway out of the slot, which is inconvenient), and two USB 3.0 ports. It’s a great range of built-in connectivity that will come in handy, especially if you plan on using the S7 in the office as part of a ‘bring your own device’ (BYOD) scheme (though the lack of Windows 8 Pro might be a hindrance in some work places that use Group Policies). You’ll be able to easily plug in a USB-based keyboard and mouse, as well as an HDMI-based monitor. The left side has the power facilities, a USB 3.0 port and the SD card slot. The right side has the headset jack, another USB 3.0 port, HDMI, a VGA port (which requires a dongle), and a little cable/tying facility. An adapter for a VGA port is supplied in the box, as is a USB-based Ethernet dongle, so you can easily connect to an older monitor and a wired network, too. Wi-Fi is supplied by an Intel Centrino Advanced-N 7260 dual-band adapter, you also get Bluetooth 4.0, and there is a webcam, a built-in microphone, and a headset port. We should point out that we experienced a few connectivity issues with the Wi-Fi adapter; we used the default drivers that came pre-loaded with our model at the time of review. It’s the available built-in ports that make the Aspire S7-392 such a convenient Ultrabook to use, especially if you’re a business user. The configuration on the inside is just as pleasing: you get an Intel Core i7-4500U CPU, which is a dual-core CPU with a standard frequency of 1.8GHz; there is 8GB of DDR3 SDRAM, Intel HD 4400 graphics, and 223GB of formatted solid state drive (SSD) space. That storage space is interesting as it is two drives organised in a RAID 0 array, which gives the S7-392 very fast overall performance when it comes to sequentially writing large chunks of data. In CrystalDiskMark, the SSD array recorded a read rate of 957.3 megabytes per second (MBps), and a write rate of 370.7MBps. Both scores are higher than what the third-generation Aspire S7-391 recorded in the same tests (907MBps read and 366MBps write), though that Ultrabook had 106GB of formatted capacity. One of the best things about the fast storage is that boot times are very short. In our cold boot tests, it took only 7sec for the laptop to go from an off state to the Windows 8 Start screen. Resume time from sleep was almost instantaneous (by the time the lid was fully lifted, the system was already at the login screen). The increase in performance wasn’t seen in all of our system tests, though. The third-generation Core i7 in the original version of the Aspire S7-391 has a 1.9GHz standard speed, while the fourth-generation Core i7 in this new laptop has a 1.8GHz standard clock speed. In our Blender 3D rendering test, the Aspire S7-392 recorded a time of 43sec, which is two seconds slower than its third-gen predecessor. Our Arcsoft Media Converter 7 test was also a little slower on the new model, recording 13min 50sec; the older model got 12min 07sec in the same test. The laptop didn’t make much noise while it was under a full processing load, despite having two fans. It got hot when we used it on an uneven surface and the vents at the bottom were blocked, and you’ll need to keep this in mind when using it on your lap for any serious processing tasks. Graphics performance showed an improvement in the new model, with the HD 4400 graphics in the fourth-gen Core CPU recording 5502 in 3DMark06, which is a gain of about 500 marks compared to the third-gen model. In the latest 3D Mark, the fourth-gen Aspire S7-392 recorded 34034 in the Ice Storm test, 4401 in the Cloud Gate test, and 615 in the Fire Strike test. 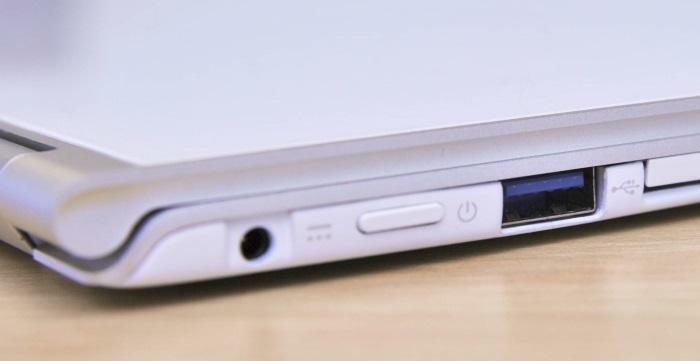 If you want to use the Aspire S7-392 for some lightweight game playing, then it will be fine (think of games downloaded through the Windows Store, for example), but it won’t be able to comfortably run complex 3D games (such as Battlefield 3, for example). While the overall performance of the Aspire S7-392 with a fourth-gen Core i7 CPU wasn’t faster than the Aspire S7-391 with a third-gen Core i7 CPU in all tests, the overall battery life of the fourth-gen unit was noticeably better. In our rundown test, in which we disable power management, enable Wi-Fi, maximise screen brightness and loop an Xvid-encoded video, the Aspire S7-392 recorded a time of 5hr 26min. This is almost two hours better than what the third-gen Aspire S7-391 recorded in the same test (3hr 34min). More importantly, we were able to get almost eight hours of life out of the fourth-gen Aspire S7-392 when using it all day at work just to browse Web pages and type things in Google Docs — in this scenario, we used a medium brightness setting, the screen was left on all the time, and we barely looked at any Flash-based video, nor did we conduct any CPU-draining activities. How long it lasts for you will depend on your workload and the types of tasks you perform, but as a general rule, this version of the Aspire S7 will give you much better battery life than the previous version. It takes about two hours for the sealed, 47 Watt-hour battery to fully charge once it’s depleted, and the power adapter is quite slim, so it won’t take up too much space in your carry bag. It's a good keyboard overall, but there are a couple of quirks, such as the tiny Caps Lock key and the F keys residing on the number keys. A soft, green backlight illuminates the keys in dim lighting environments, and it’s a light that comes on automatically via the ambient light sensor that’s installed just above the screen. We like the look of this light a lot, but there are a couple of problems with it: it switches on very slowly once activated by a key press, and it isn’t really bright enough to make the lettering easy to see. In some cases, the brightness of the screen can also make the backlight hard to see at night. We think a backlighting system that switches on quicker and which supplies more contrast is needed. The keyboard backlight doesn't provide much contrast and can be quite hard to see at times. The touchpad is large (106x60mm) and it’s centred according to the space bar rather than the left and right edges of the chassis. This makes the left palm rest a little small, but we think it will be big enough for most hands. The touchpad doesn’t sit flush with the palm rest, which means there is a noticeable ‘dip’ when performing Windows 8 swipe-in gestures, but the pad performed those gestures without any problems. The touchpad on this Aspire S7-392 is from Synaptics, and it’s improved over the ELAN pad that we saw in the Aspire S7-391. Primarily, you now get support for three-finger flicks, which we use all the time, rather than two-finger taps. Sometimes the tracking of the pad was a little jumpy, but we had few problems with it overall. We did notice one thing that will possibly cause problems (or rather, annoyance). Whenever we picked up the laptop from either the left or right palm rest, we heard a clicking sound. Initially, we thought this was due to a faulty seal between the bottom panel and the chassis. However, it turned out to be the touchpad clicking inadvertently. It seems that the bottom panel puts pressure on the touchpad and causes it to click, and we hope this is only a trait of our test unit because it undermines the otherwise good build quality of the Ultrabook (especially when you consider the premium price). As mentioned earlier, the hinges that hold the screen are strong, and the screen is latch-less. It’s held closed by magnets, but it can be lifted open relatively easily with hand when the Ultrabook is sitting flat on a desk (as long as you can find the little lip). 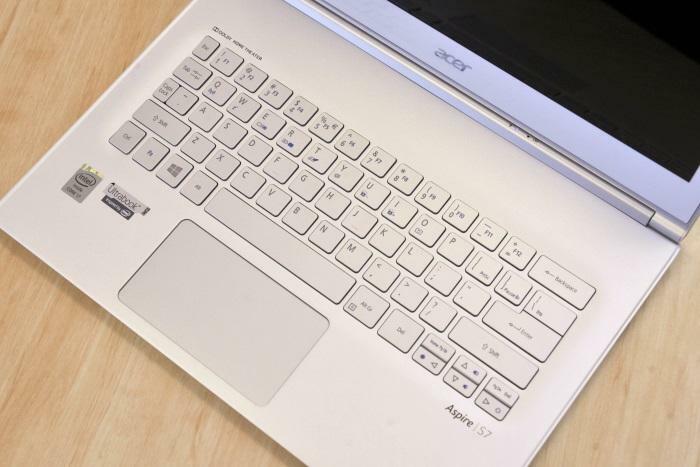 There is plenty of space above the keyboard — Acer hasn’t populated it with shortcut buttons, or even a power button — and there are two speakers on the sides. These speakers do a good job of providing a full and reasonably loud sound — we enjoyed listening to music through the speakers on this Ultrabook. 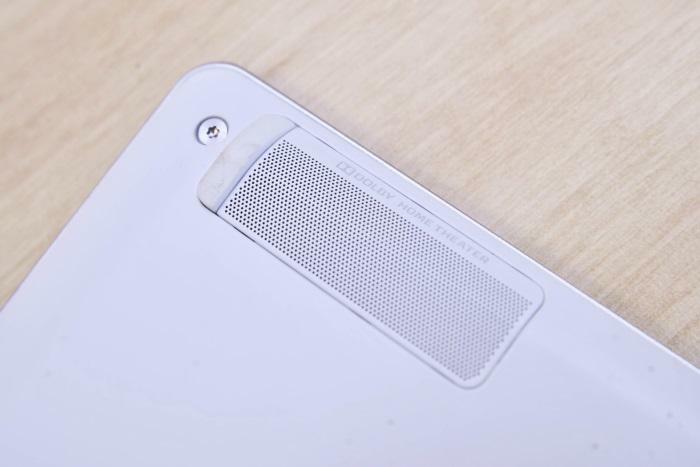 The speakers are located on the underside and can be easily blocked. But when they aren't blocked, they sound great. We don’t like the placement of the power button on the left side of the unit. It’s a very shallow button and it’s too easy to inadvertently press, especially because the power connector is right next to it. We managed to turn of the system many times while in the process of plugging and unplugging the charger. We think Acer should either move this button to a spot above the keyboard, or make a sliding switch rather than a button. This power button is shallow and too easy to inadvertently press, especially when plugging in or unplugging the power adapter. For $2399, the Core i7 version of the Aspire S7-392 is definitely a premium product, and it’s worth it if you want something light and sturdy, a good looking screen, solid overall performance, and useful built-in ports. However, it’s not perfect. The clicking we noticed every time we picked up the laptop was annoying, the power button location often made us press it without our wanting, and the keyboard could use some improvements. A version of the Aspire S7-392 will be available in New Zealand for $2199 from Noel Leeming and selected Harvey Norman stores.